Breeding Poodles is the passion of many dog lovers; it is an iconic breed eulogized for its intelligence, athleticism, and hypoallergenic coat. 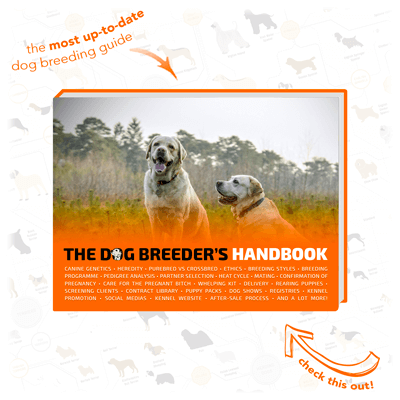 Because of its huge popularity, Poodle breeders must be aware of all the breed-specific considerations to have and practices to follow before breeding poodles. If you are here, you are probably wondering how to breed Poodles ethically and responsibly. Only a twisted mind would congratulate itself on breeding sick or unhealthy dogs. 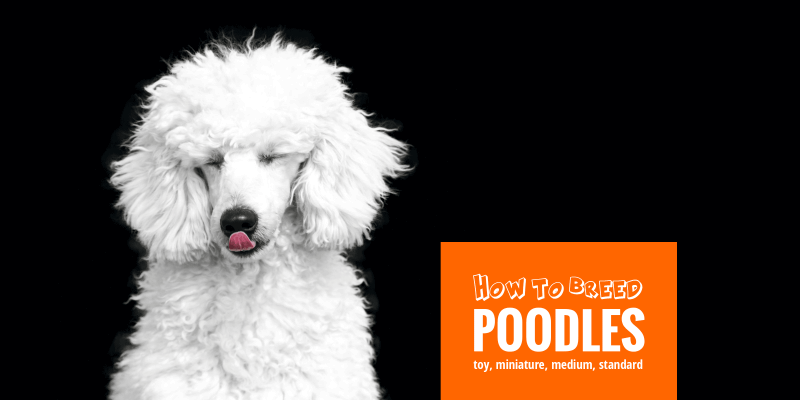 In this article, we are giving you a lot of pointers and concrete pieces of information so you can breed healthier Poodles of any type: toy, miniature, medium, or standard. The Poodle is a favorite breed in the West and a lot of unethical puppy mills are breeding them, general to reach an extremely small size. 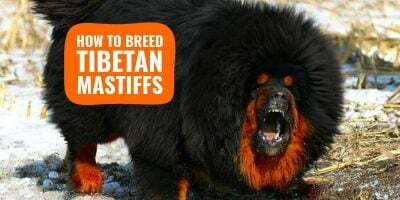 Such hyped up breedings are sadistic and profit-obsessed decisions, rather than well thought out planning. Trends come and go, but these conform Poodle types have been around for centuries. People and poodles have a long shared history. Dogs resembling poodles can be seen on walls and artifacts in Egypt dated hundreds of years B.C. The identifiable modern breed of poodle has its roots in Germany around the year 1400 A.D. This is the time that a water dog appeared that was called, a “pudelhund” which roughly translates to “dog that splashes about”. Poodles were first bred as water retrievers with ancestors from other European water retrievers. Poodles appear in the works of German painter, Albrecht Durer, in the 15th century. Some French breed historians claim that the poodle originated from France and was bred from the Barbet and the Hungarian water dog. The French word for poodle, caniche, is said to derive from the French word for a female duck (“cane”) because of the larger-sized poodles’ work as a duck retriever. Eventually, the poodle was bred into the three sizes recognized today: standard, miniature, and toy. A fourth size, the medium, is recognized in France and by the Federation Cynologique Internationale. All the smaller sizes are later products of selective breeding from the standard size. These smaller poodles were first used in France to hunt truffles, but the toy was always a companion dog. The toy was a favorite of the royal court of Louis XIV, Louis XV, and Louis XVI. The smaller types, also, became favorites for gypsy and circus performers. Today, the American Kennel Club recognizes one breed of Poodle with three types—standard, miniature, and toy. All three types have the same standards and are separated only by size. The standard must be 15 inches or more at the shoulders; the miniature stands at the shoulders 15 inches to a minimum of height more than 10 inches; toy must stand no more than 10 inches at the shoulder. There are ten colors recognized by the AKC for conformation showing. The AKC recognizes for show only solid colors. A coat of more than one color is considered a fault as per the official standard of the Poodle breed. When breeding Poodles, mixed colors should, therefore, be avoided. Standard is the largest of the recognized size of the Poodle breed. According to the AKC standards, the standard poodle must exceed 15 inches at the shoulder. The standard poodle was first bred to be water retriever. It, also, has been used in other capacities such as a helper in wartime. The standard poodle is built to swim and loves to dive in after a prey. It is an intelligent, and highly trainable companion for duck hunters. Its use as a hunter was not appreciated much in the United States until the 1990s. Since then, the standard poodle has grown in popularity as a hunting dog. In 2013, a standard poodle named Cooper became the first poodle to earn the title of Master Hunter in three registries. Cooper even starred in the television show, “Duck Dynasty” and showed off his retrieval skills against three labradors. In the United States, this kind of popular exposure has helped continue the revival of the standard poodle’s role as a water retriever. The standard poodle, though, is by far a companion dog that finds his home in many walks of life. Poodles are active dogs, and a standard poodle needs an owner that will give the dog exercise for its intelligent mind and athletic body. They are not an aggressive dog but may be reserved around strangers. They are the most family-friendly of the three types. The standard poodle suffers more from serious health problems than its smaller brethren. They are more prone to hip and elbow dysplasia and a disease of the femoral bone called Legg-Calve-Perthes in which the femoral bone receives a lack of blood and bone tissue dies. This condition results in joint deformity similar to what is found in hip dysplasia. They suffer, too, more often from Addison’s disease. This is a disease in which the adrenal glands do not produce enough of adrenal hormones. It is ultimately a fatal disease if not treated by supplying the necessary hormones. Standard poodles are more susceptible to sebaceous adenitis, an inflammatory skin disease. More than 40% of standard poodle deaths are caused by cancer. It has a life expectancy of 12-15 years. Are poodles hypoallergenic? Yes if you listen to their owners, but no if you are reading scientific papers. The Federation Cynologique Internationale divides the poodle into four types: standard, medium, miniature, and toy. The medium poodle is a dog over 35 cm up to 45 cm at the withers (a height of approximately 14-18 inches.) This type would be identified in France, and in the over 90 countries in which the FCI is followed. Some Poodles in the medium category could qualify as miniature or standard in other clubs (such as the American Kennel Club.) The descriptions of the miniature and standards, therefore, can be applied to this group depending on which end of the spectrum the dog is on. The miniature poodle is recognized by the Kennel Club and the AKC (among others). Miniature means a poodle of no less than 10 inches and no more than 15 inches in height at the shoulders. The miniature poodle was developed originally in France to hunt truffles. These dogs can excel in advanced obedience and agility competition. They are quick, athletic, and highly intelligent. They are the most popular of the three types. Miniature poodles are a sensitive dog that is wary of strangers. They are not an aggressive dog. They will bark if a stranger is outside the house. They, also, do not like much change in their routines. They prefer a peaceful environment and do not enjoy roughhousing. Miniature poodles usually weigh fifteen to seventeen pounds. They have a lifespan of 13-15 years. Poodles are built to be a square breed. The torso is supposed to be equal in length to the dog’s height at the shoulders. A miniature poodle is at special risk for chondrodysplasia. This is a genetic condition that affects the growth of cartilage in a dog’s legs. The result is a kind of canine dwarfism with short legs being the main sign. A miniature poodle with this condition does not have the “square shape.” Other health problems may be associated with it including heart abnormalities, joint pain, and spine curvature. The toy poodle is a poodle of no more than 10 inches in size at the shoulders. This smallest type of poodle has always been a companion dog. It was the favorite of the French royal courts especially the court of Louis XVI (1638- 1715.) Rich owners in the Renaissance era often carried their toy poodles in their shirt sleeves. There they served as hand-warmers. As a result, toy poodles came to be called “sleeve dogs.” Toy poodles, also, could be found as trick performers for gypsies and in circuses. By the 19th century, the toy poodle was an identifiable and popular type of poodle in England. Many of the rich and famous have chosen the toy poodle as a pet. As a result, this type has been given the undeserved reputation of being a pampered wimp of a dog. In reality, the toy poodle is just the diminutive ball of intellect and athleticism of its larger type. They have a strong will to please their owner, and highly trainable. They have retained the stuff that gave their bigger type a place in history on the battlefield with Napoleon Bonaparte. This dog is susceptible to most of the ailments of the other types of poodles. It can suffer canine dwarfism and may develop skin tumors. These skin tumors can become malignant, and as result cancer is a big cause of death. Nevertheless, toy poodles are a long-lived type with an average lifespan of 15 years. A toy poodle was among the list of longest living dogs recorded in the Guinness Book of World Records. Seamus, the toy poodle, lived to the ripe old age of 20 years and 298 days (7/24/1993 — 5/18/2014). Just like every other purebred dog breed out there, Poodle have garnered several health conditions that are affecting the Poodle breed in particular. When breeding Poodles, the Poodle breeder must use every single health screening available at that time to ensure the perfect health of his breeding dogs. 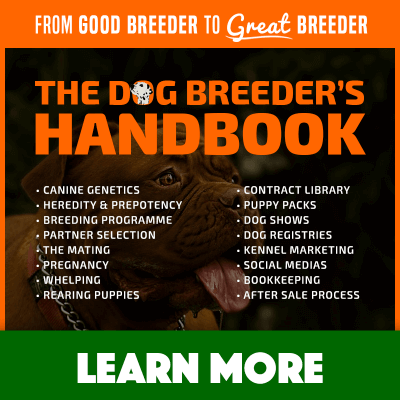 There is no room for trials and errors because once a genetic carrier specimen is bred and produces a whole litter of puppies, the potential for this disease is now multiplied. 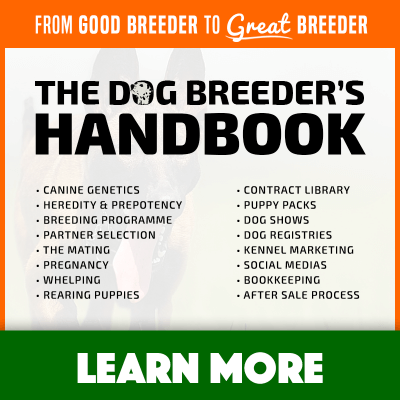 If you are wondering how to breed Poodles, then start by screening every single dog you are planning to breed; it’s not cheap, but it is not incredibly expensive either. Addison’s disease is a serious disease of the adrenal glands. The adrenal glands are glands that are responsible for manufacturing important hormones that regulate bodily functions like metabolism and blood pressure. The lack of the hormones cortisol and aldosterone impact the electrolyte balances of sodium and potassium. This can result in such severe consequences such as shock and sudden death from a cardiac arrest. A dog will show signs of illness like vomiting, loss of appetite, lethargy, shaking, and a painful abdomen. Addison’s disease is known as the “great pretender” because the symptoms are shared with many other conditions. The standard poodle seems to have a recessive gene responsible for Addison’s disease. There is currently no genetic test for the condition. One study of 1722 standard poodles found an incidence rate of 8.6%. Breeders of standard poodles need to know the symptoms and be ready to contact a veterinarian. The disease is most common in young, female, and middle-aged dogs. The test for Addison’s disease is a relatively simple blood test in which a dog’s adrenal gland functioning is tested by injecting the hormone ACTH. A normal dog’s adrenal glands will respond by an increase in the hormone cortisol. A dog that fails the ACTH stimulation test by an insufficient level of cortisol will be diagnosed with Addison’s disease. The treatment for Addison’s is a lifelong regimen of hormone replacement. If treated, a dog with Addison’s will have a normal lifespan. A dog with Addison’s disease should not be bred. The Poodle breeder must use every single health screening available at that time to ensure the perfect health of his breeding dogs. Bloat occurs most often in deep-chested dogs. It occurs most often in the standard poodle. It is a medical emergency. In bloat, the stomach of the dog fills with air and twists on its axis. This results in a stoppage of blood flow to the vital organs of the dog. A dog that is not treated will ultimately fall into shock and die. Symptoms of bloat include nonproductive vomiting, drooling, restlessness, and a tight and painful abdomen. Approximately, a third of dogs with bloat will die or have to be euthanized. Currently, there is no way to completely prevent bloat. Risk factors have been identified such as single feedings, dry food, and higher chest depth-to-width ratio, underweight, and older age. The incidence of bloat in standard poodles is 4.4.%. Epilepsy is another health problem common in poodles. All types of poodles are at risk. A poodle with epilepsy will show signs of seizures such as drooling, unusual movements, limb rigidity, and collapse. Sometimes the cause is a brain tumor which may require surgical treatment. In most cases, the cause is unknown or idiopathic. There has been considerable medical studies of the condition in poodles. Researchers at Florida State University and the University of Missouri have pooled their information to further the investigation of the genetic causes of epilepsy in thirty breeds of dogs including poodles (all types,) The research into the genetic mechanism of the condition seems to point to a recessive gene, but there may be more than one gene involved and more research needs to be done. One study of over a half million dogs and thirty-five breeds ranked the incidence rate of standard poodles at 20%, being the 12th highest in the 35 breeds studied. Poodles are affected by progressive retinal atrophy or PRA. In this condition, the rods and cones in the retina of the eye deteriorate. The ultimate result is blindness. Initial symptoms will be trouble seeing at night. One form of PRA can be detected by genetic testing. Dogs can be detected both as affected and carrier of the disease. Toys and miniature poodles will typically start to show signs of PRA around three years of age. There is no treatment available. The poodle’s coat is its most unique and distinctive characteristic. An adult poodle has a single coat of curly fur. Many breeds have an undercoat which sheds at regular times of the year. Poodles don’t shed like that. Their fur does grow out, but when it does it is trapped by the surrounding dense curls. In addition, poodles grow their new fur very slowly. They only shed fur approximately every three weeks compared to some breeds’ every four days. Dander means those pieces of dead skin shed with the fur. It is the most common reason for human allergy in dogs. Unfortunately, it is not the only one. People can be allergic to the fur itself, saliva, or urine. Also, the dog can be a carrier for other common allergens like pollen, dust, and mold. The American Kennel Club along with the general public list the poodle of one of a few hypoallergenic dog breeds. However, most allergists would dispute a claim that poodles can’t be the source of allergies. In fact, a widely-reported 2011 investigation showed no difference in the number of allergens in households with different breeds of dogs. The hypoallergenic breeds including poodles did not result in lower numbers of allergens. Still, there are many anecdotes of people with dog allergies having no allergic or lessened allergic reaction to poodles. 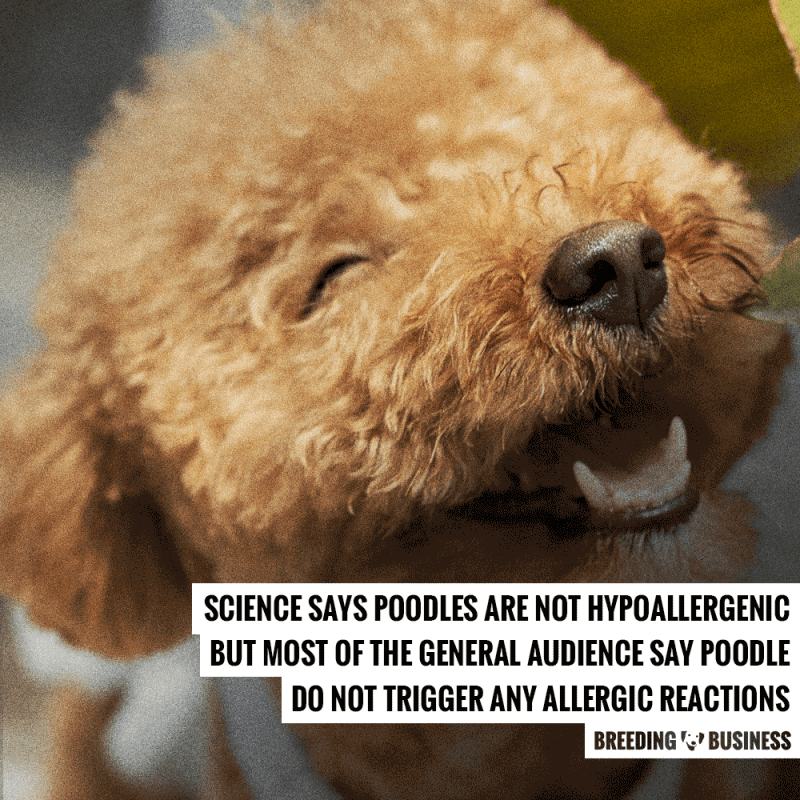 It is probably safe to say that there are enough people that would vouch for the proposition that a poodle will “reduce or minimize the possibility of an allergic response” (i.e. hypoallergenic.) So while the science has not supported the idea of accepting dogs as hypoallergenic, the market will more than likely continue to make the claim. When breeding Poodles ethically, there are other breed-specific factors to understand and factor in on top of the more academic knowledge (pertaining to canine reproduction.) When you are invested in Poodle breeding, you are doing your absolute best to better the breed by bringing better specimens to life. Every Poodle mating should be carefully planned so that the puppies become obviously better Poodles (as per the standard’s definition) than their parents. So here are a few Poodle-specific breeding practices to consider when breeding your favorite type of poodle. The average size of a litter of poodles varies with the type. In general, larger dogs have the capacity for larger litters. Standard poodles average six puppies, miniatures average five, and toys average only three. Toys not too infrequently will only whelp a single puppy. The largest litter ever recorded for a standard poodle is sixteen puppies. Poodles usually whelp their puppies naturally with no human intervention required. They are not among the breeds ranking highest in the need for c-sections. Surgical delivery of puppies is necessary for different situations. It may be required when the pregnancy continues past the due date or if a maternal condition like eclampsia (high blood pressure/kidney failure) necessitates an early delivery of the puppies. A puppy’s size might not fit through the birth canal (dystocia). In this situation, a dam will labor with no puppy being whelped for an extended period of time. Toys and miniature poodles are more likely than standard poodles to require a cesarean section. Toy dams that are bred to be extremely small are at an increased risk of requiring surgical delivery. The idea of a small puppy that will fit in an article of a person’s clothing did not end with the “sleeve dog” popular in the Renaissance. There is a market today for a dog so small that it fits in a pocket. Toy poodles are one of the many toy breeds that some breeders have been selectively breeding for ever smaller dogs. There are many “teacup poodles” advertised for sale on the internet. In many ways, this is just a continuation of what has been going on for hundreds of years. The demand for smaller dogs a couple of hundred years ago is what first created the miniature and toy poodle types. It is possible to produce a healthy smaller dog in this way. Unfortunately, these tiny specimens are at higher risk for joint and limb deformities including patella luxation (kneecap dislocation) and hip dysplasia. They are, also, more prone to heart defects as well as many other health problems. The creation of healthy bloodlines of these tiny dogs will require either a long period of time or careful breeding. There is a lively debate on whether or not they should be bred. Some breeders like to create poodles of different colored coats. The standard for all types of poodles is a solid color. Nevertheless, there is a demand for parti-colored coats. Parti-colors are two colors that appear in various places of a dog. A favorite parti-color coat is a tuxedo coat in which the coat is a solid black on the back from the front to tail with a white chest and lower torso. Another popular color variation is the phantom. The phantom has a base color of cream, silver, black, apricot, white or brown. The second color appears across the chest, down the legs, under the legs, above each eye, and on each side of the muzzle. These poodles that deviate from the standard in color are able to be registered by the AKC. They are ineligible for conformation shows but do compete in other competitions like obedience and agility. Many beautiful companion dogs of various patterns of color have been selectively bred by reputable breeders. There is no evidence of any link to a health defect or disease based on color alone. The idea that a poodle’s coat is allergy-free has driven breeders to try to create other breeds with the same fur. The crossing of a poodle and another breed has created a hundred different poodle hybrids. The most popular dogs ultimately will be cross-bred with a poodle in order to make it available to those that like a low shedding dog for whatever reason. Favorite crosses include cockapoo (cocker spaniel), maltipoo (maltese), labradoodle (Labrador retriever), goldendoodle (golden retriever), schnoodle (schnauzer), peekapoo (pekingese), and yorkipoo (Yorkshire terrier). None of the cross-breeds is recognized by the AKC. These hybrids are often referred to as designer dogs. Many times these dogs are marketed for prices well above what the parent cross would cost. Some of the cross-breeds have been popular for quite some time. Cockapoos, for example, have been around since at least the 1960s. They are the oldest of today’s so-called designer dogs. This cross-breeds of a cocker spaniel and a poodle produced a smallish intelligent dog with a coat that did not shed much and required less grooming than a poodle. Several clubs sprang up to help legitimize this popular dog The American Cockapoo Club and the Cockapoo Club of America are a couple of examples. The Labradoodle is a newer addition. This cross breed of the Labrador retriever and the Standard poodle is a large dog with a wiry or wavy poodle-like coat. Wally Cannon is said to be the father of Labradoodles when in the late 1980s he bred the hybrid for an American couple who needed a service dog that was hypoallergenic. Mr. Cannon, at that time, was the breeding manager for the Royal Guide Dog Association of Australia. Though he reports regret for the hybrid’s creation, the Labradoodle has only increased in popularity. Like the cockapoo, the Labradoodle has its own club which seeks to standardize the breed. It is uncertain whether or not any of these hybrids will stand the test of time. Breeders of many of these hybrids or designer dogs come under fire for their breeding programs. Many puppy mills have been associated with these types of crosses, particularly of the toys. The demand has been so huge thanks to viral social media videos of these cut toy dogs that puppy farmers have been producing them at worryingly huge rates. Although science has not backed the claims that even poodles are hypoallergenic, the need is there and the quest for that perfect dog continues in these many hybrid dogs. Puppies that are not the first generation of hybrids may have bloodlines that lack important information on health and temperament. Frequently, buyers of hybrids may not be able to research successfully the heritage and pedigree of the dog. Genetic defects of varying consequences can be amplified when parentage becomes unknown. I was reading under poodle info coments about designer dogs. I would like to add info. My breeding program may be controversial breeding retrivers and poodles. I am a lover of all dogs but I do like some more than others. I like my dogs sweet and smart. I love the low to no shedding. I have completely fallen in love with my Double Retriver Doodles! (Labradoodle+Goldendoodle)They are smart and sweet. Happy and cuddly. Protectors and great companions. Not a good dog for non participating ownership. High maintenance coats but so beautiful some are smarter than the owners barganed for . my standard size dogs need a fenced yard to get their “zoomies” out. Having 2 doodles is always great fun. They put on quite a show when they play together. They are dogs breed for what people want in a family pet. Not for duck hunting or retrieving or other pure breed skills, not that they can’t but typically they are Just for compainionship and fun. Just trying to spread the love one puppy at a time, like most breeders.